Can sovereign defaults tank the global economy? The 2008 financial crisis had many causes, but the underlying theme of the meltdown was that businesses and individuals took on too much debt. Since the bubble burst, the country has been dealing with the problem of casting off much of this debt, through defaults, restructuring and austerity. The federal government has tried to smooth the transition by taking on more debt of its own, but as long as the private sector is contracting its total debt, it’s difficult for the economy to really begin expanding. In this week’s Flow of Funds report the Federal Reserve confirms that this process is over, and that private households are likely ready to start taking on debt once again. This is a good sign. But we’re by no means back to levels where we were. On the other hand, growth is growth. 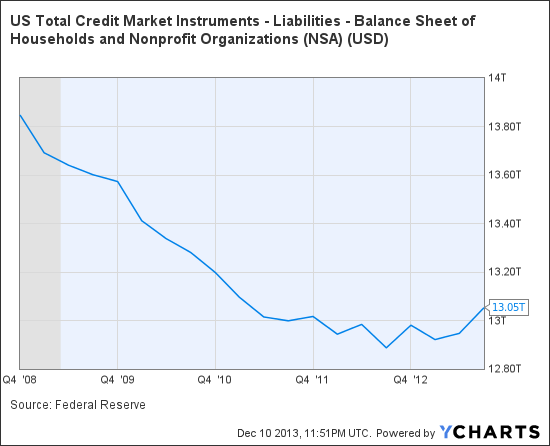 The economy rarely grows without private sector debt accumulation so this is a sign that balance sheets are normalizing. This isn’t to say that the economic recovery will all of a sudden take off on this news, or that we can sustain a healthy economy on new debt alone. Remember, it was overreliance on debt to paper over weak income gains which helped create the last bubble. But it is a sign that the average American consumer has made serious progress dealing with his debt issues, and that he won’t be afraid to take out new debt if needed. As far as government policy is concerned, if the private sector is more willing to take on debt, it relieves pressure from both the Federal Reserve and the federal government to stimulate the economy.